Being brave includes tolerating minor embarrassments. For example, Aquiliana invited me months ago to a Workplace Blog Hop. I accepted because she is a dear and I have wanted to share something concrete about my online connection with you. I’m slightly embarrassed that I’m so late to this party and my only excuses are these. 1. I want my workplace to look neat. Not to misrepresent myself but, do you really want to look at my clutter? Correct me if I’m wrong, but I don’t think so. 2. I want my workplace to look pretty. That takes Arizona sun shining through my window. Every time I organized my desk, the sun wasn’t shining. When the sun was shining, my desk was a mess. 3. The holidays hit. Decorations for Thanksgiving, then Advent, then Christmas, then New Year came in from the garage, the attic, and the sheds. But nothing left my house! Clutter creeped to my office. And here’s the fun part. Inspired by talented and skilled blogging photographers, of which I am not, I snapped some pictures. I looked for a nice angle, interesting colors, and something that captures how I feel at my desk. Taking my time, I enjoyed the challenge and process of looking, focusing, and choosing. Here are my favorites. The sunshine draws me to my pretty corner. Love my white chair. Take a seat and look across the desk I share with my husband, dashing Dave. I love looking over my cool blue MacBook to the masculine blacks and neutral tones. Open my laptop and look at my notes. 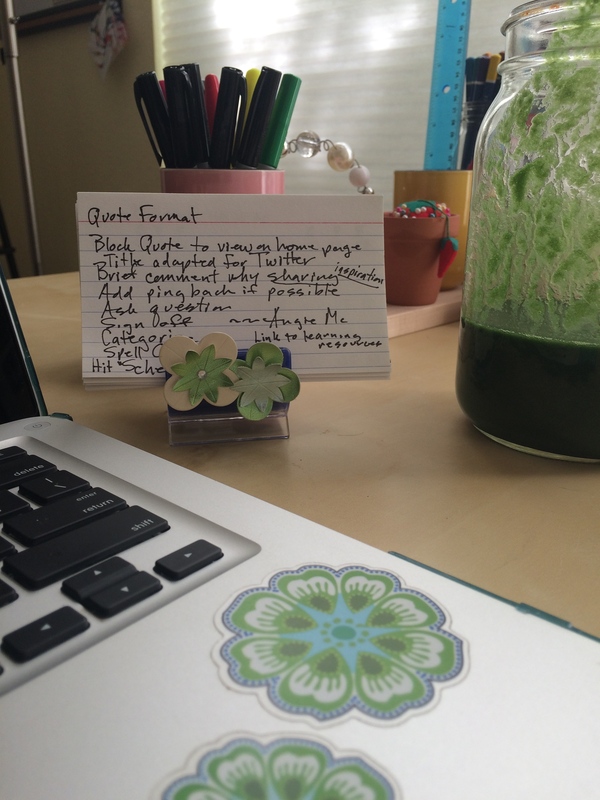 I’m index card, ultra fine point sharpie, and green smoothie obsessed. Sheer shade allows the sun to dapple through a large blue hibiscus bush outside. Office supplies made attractive. Red stapler makes me laugh. Hint: the movie Office Space. Piles of books related to my latest passions surround me. This pile sits to my left, ready. They are full of quotes. The other half of my office is, shall we say, currently occupied and unable to attend a photo shoot. I hope she becomes available soon. The rules are basically to spot your personal blogging space through a few photos, to link back to the blogger who invited you and to invite bloggers to join you. Enjoy it! Clean tidy and so neat! 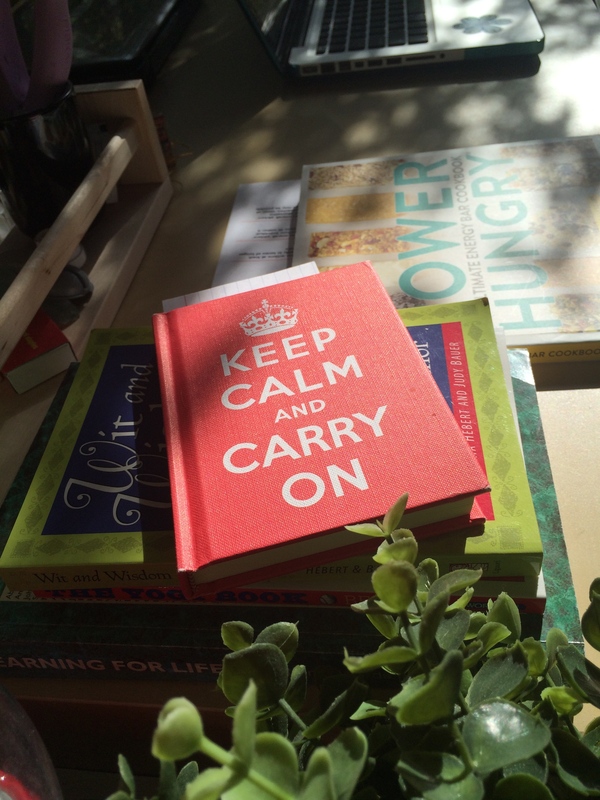 … I love the keep calm and carry on notebook and the We can do it poster!… I have a mug with the KCACO theme on my wokplace!. High Five!. How fun. It’s always fun to see other people’s creative space! Love all your color and light! Coming from you, Jill, that means so much! What I have seen of your home is so lovely. 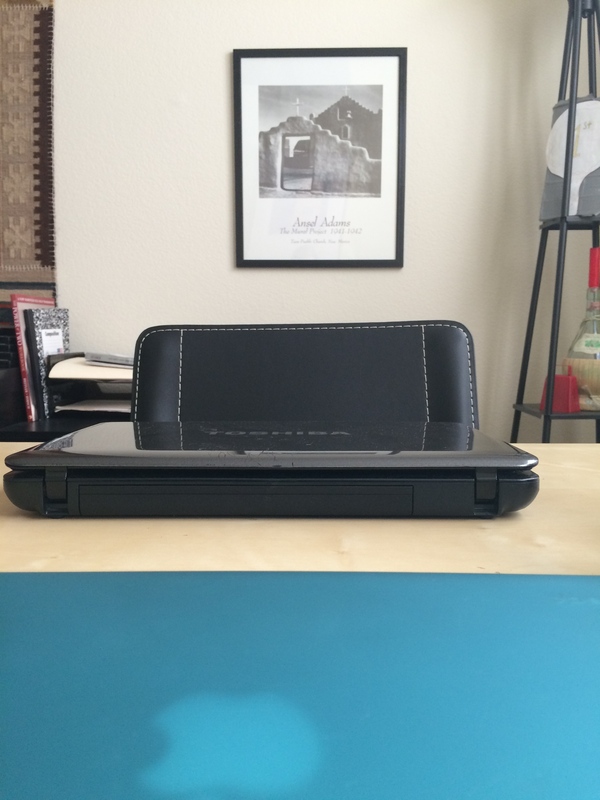 Would love to see your blogging workplace! Have you posted about it already? Sometimes I blog on my work break, Angie. In fact, that’s where I do it most of the time now. I don’t work my standard hours, so I can come in early or leave late and do it then, though during the time I’m working I try to give my employers their money’s worth. 🙂 When I blog at home, I always feel a little guilty I’m not doing something more responsible, or focusing on my kids. So… I’ve become an irregular blogger. I lack the discipline to be otherwise, at least for now. Dane, you have your priorities straight. I, too, have been squeezing time in to blog here and there, which isn’t a bad gig. But I hope to increase my time here, get better at blogging, over the next year. More on that in future posts. God bless you and yours! I do a lot of my blogging at work. I hop on and off, and it never really interferes with my job. Also through my phone and tablet. There are times I feel like a gypsy here, there, everywhere. 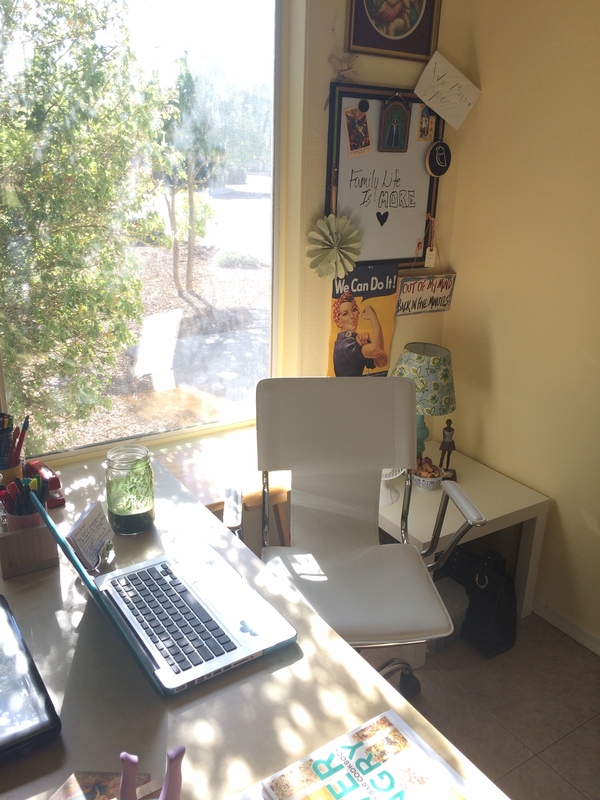 angie mac – your workspace looks bright and relaxing – with the sun shining in is especially nice. where’s the other half? just kidding…. and we have an upstairs home office where most work gets done, but sometimes I move the computer to the dining room – not so much anymore – but for a few big projects I have worked there for a few days straight and it was a nice fresh environment – with easy access to outdoor stretches – ha! I enjoyed your pictures – and actually form other ones I have seen on your site I’d say you have a great photographer’s eye = especially with some of the ones you play with light. I have several work spaces, lately I feel one of them requires me to suit up in protective gear before I enter. The good news is I will be leaving that protective gear work space in 2 months. 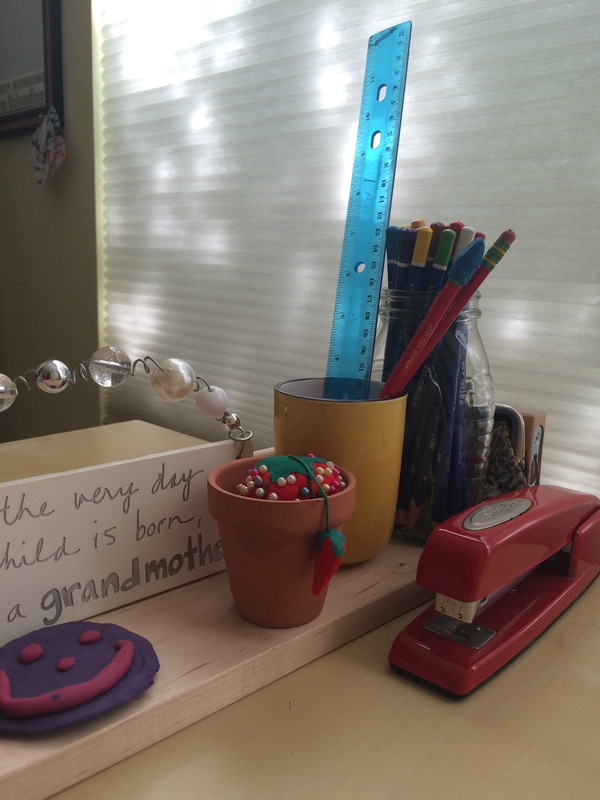 What I like best in a work space is sunlight, some organization, background music, and pictures/mementos of my wife and children. Also, I found standing works much better for me than sitting. Being brave, this is very timely for me, being in the process of a career change and other challenges, I have daily opportunities to be brave or not to be. Lately, the latter has been winning, so from here on out I resolve to behave bravely, have faith, and rely on those who love me. Your work space looks very beautiful, inviting and energetic just like you! Keep up the great work! !